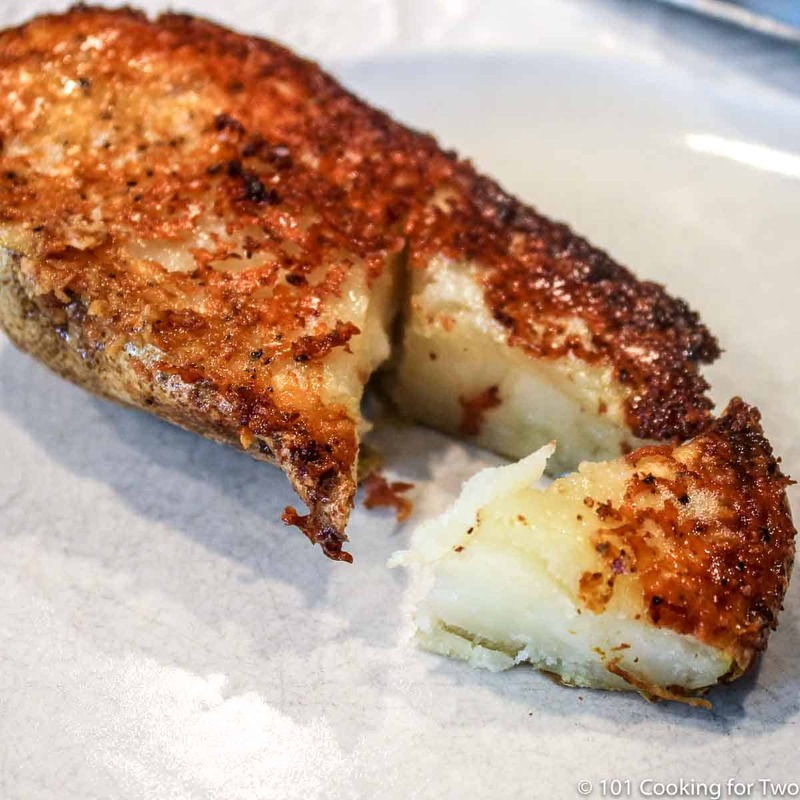 Meet your new favorite side dish; crispy Parmesan crusted baked potato halves infused with garlic and butter. Just follow these easy step by step photo instructions. Skill level 2/10, just don’t cut yourself with the knife. Editor’s Note: Originally Published May 18, 2013. Updated with expanded discussion and updated photos. I experimented on my wife on Saturday with this. She loved it so much I had to repeat it the following day (Mother’s Day) to go with her porterhouse steak. That is high praise folks. Start with some butter, seasoning, and parmesan in a glass baking pan. Scrub up some potatoes, cut in half and place cut side down on the parmesan. Bake and allow to cool in the dish for a few minutes to firm up a crust, and you are good to go. This is a combination of multiple recipes. I cut those recipes down some and add seasoning which was sorely lacking in most. A lower 5 but about as good as a potato gets. 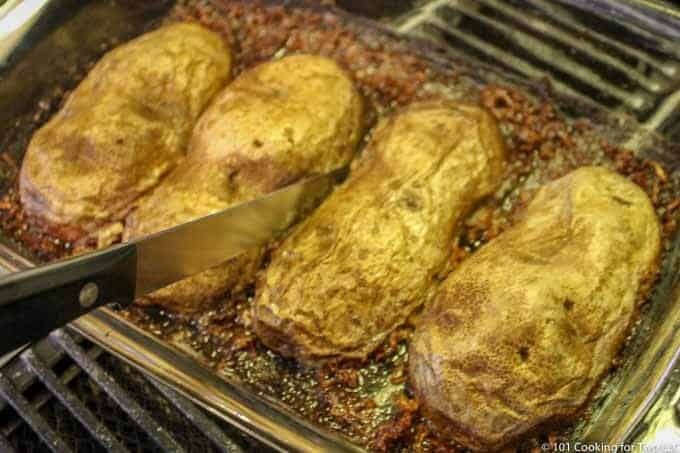 This is just half of a baked potato. I highly recommend the traditional russet baking potatoes, but any potatoes should be fine. Potatoes will all cook the same. A very good Parmesan cheese will go a long way to making this dish spectacular. A cheap cheese will give cheap results. To adjust the size of this recipe, a little math is needed. You want the “topping” to be about the same thickness. Just close is fine, exact is not needed. So the size of the pan determines the amount of topping ingredients. I use a 9X5 dish which is 45 square inches. To use a 9X9 which is 81 square inches, double the topping ingredients which is close enough. A 9X13 is 117 square inches which is about 2.5 times the area of a 9X5 so increase the ingredients by that much. So time for some old math skills. Hope that makes sense. Adjust the spices/salt/pepper/garlic to taste. 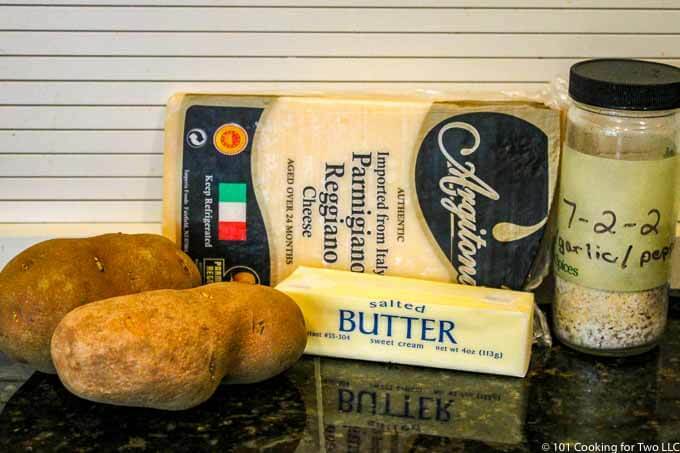 A little less butter would work but with this amount the taste will infuse into the potato better. The glass baking dish will help this not to stick, but some recipes call for non-stick pans or foil. I’m a little leery of the foil. 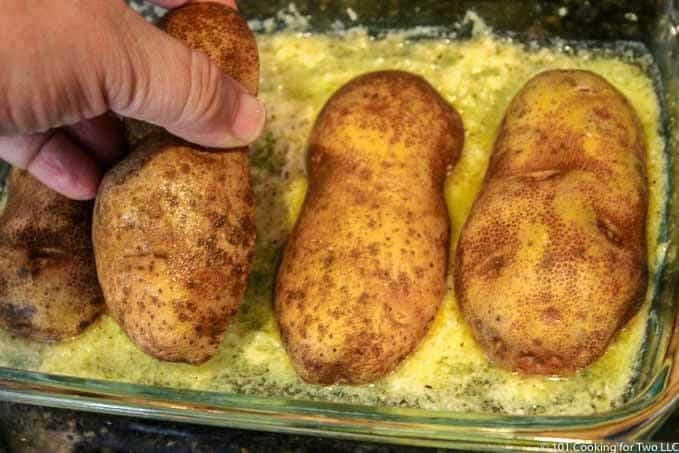 The potatoes must fit flat in the dish. Pick a dish size that fit the amount you need and adjust the ingredients to cover the bottom well. These warm up nicely in a microwave and taste very good but are not as nice looking so great for leftovers but not a cook-ahead recipe for company. The serving amount will be a little less than you think. These are very filling. If you normally eat a whole baked potato, the half will be about right. Preheat oven to 400 degrees convection (425 regular ovens). 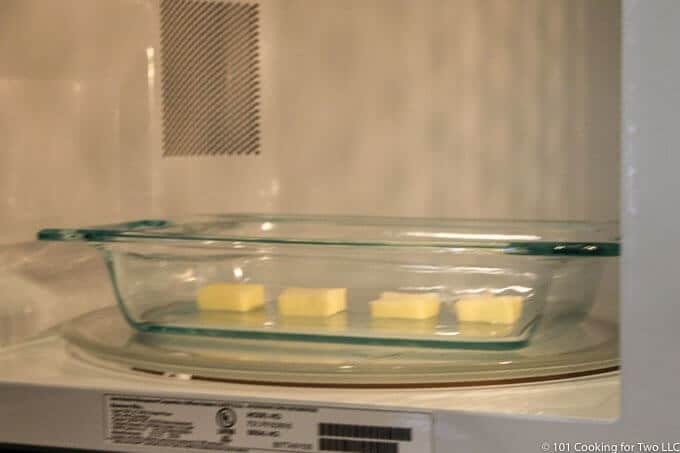 Melt butter in a microwave (about 30 seconds). This is 4 tablespoons in a five by nine glass baking dish. Spread the butter over the bottom of the pan. Sprinkle with 1 1/2 teaspoon of 7:2:2 (linky) (or 1 teaspoon of coarse salt with 1/4 teaspoon each of granular garlic and pepper). Sprinkle 1/2 cup of grated parmesan. Fresh is better, and I love Parmigiano Reggiano. Scrub two medium russet and cut in half. Lay the cut potatoes flat on the parmesan mixture cut side down. Bake until potatoes are done. About 40 minutes. A done potato is 210 degrees. Remove from oven and allow to cool for 5 minutes to let a crust form. 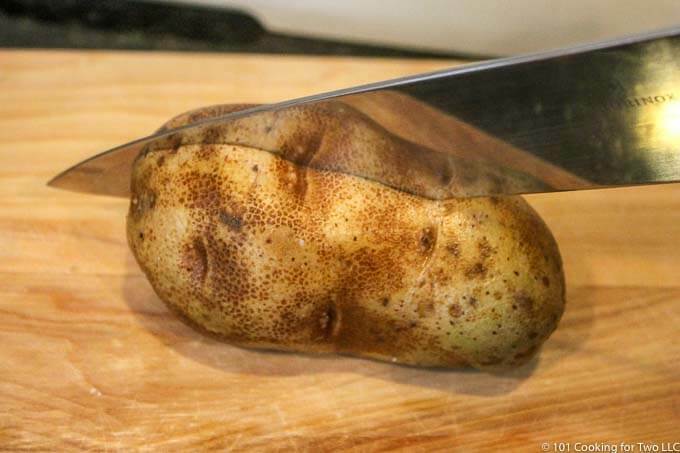 Then run a knife around the potato, so the crust does not pull off. Remove from the pan carefully and serve. They will stay hot for a while. 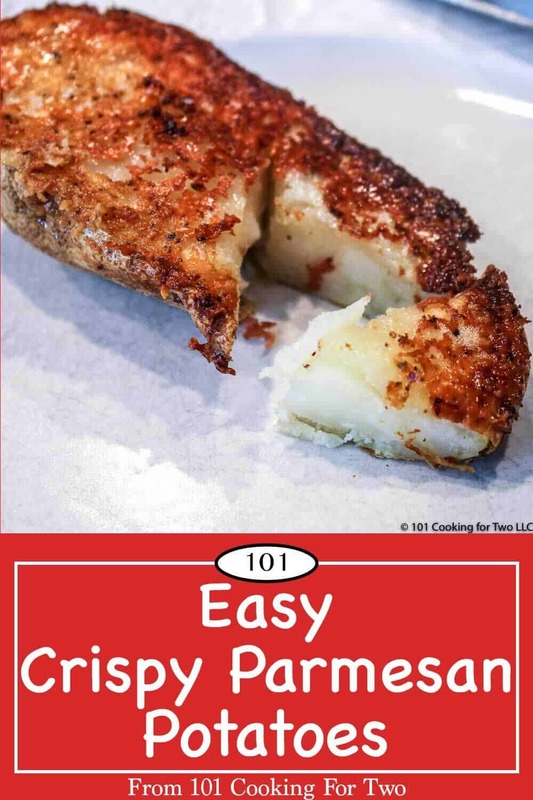 Meet your new favorite side dish, crispy parmesan crusted potato half infused with garlic and butter. Just follow these easy step by step photo instructions. Melt 4 tablespoons butter in a 5 by 9 glass baking dish. Adjust size and amount of ingredients to fit your needs. Scrub two medium russet and cut in half. Adjust amount and type of potatoes to your needs. Remove from oven and allow to cool for 5 minutes to let a crust form. 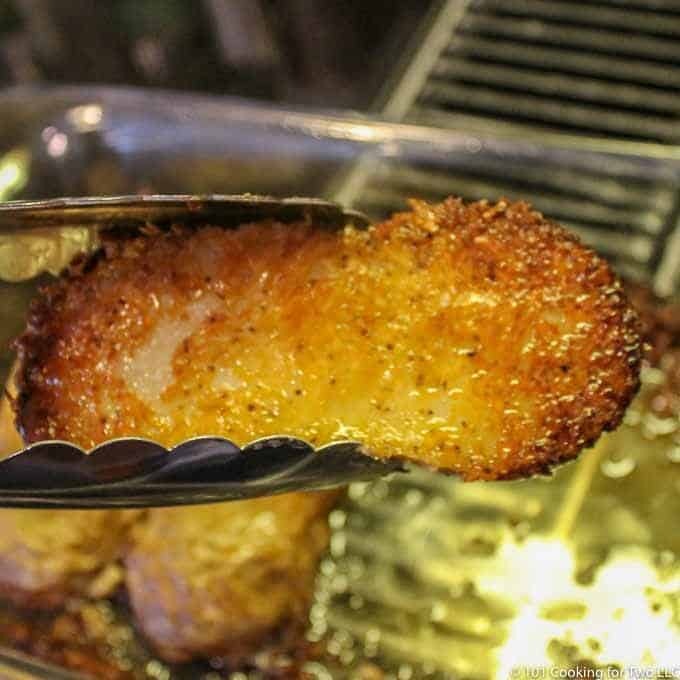 Then run a knife around the potato, so the crust does not pull off.Remove from the pan carefully and serve. They will stay hot for quite a while. These warm up nicely in a microwave and taste very good but are not quite as nice looking so great for leftovers but not a cook-ahead recipe for company. I suggest using russet potatoes for this recipe. 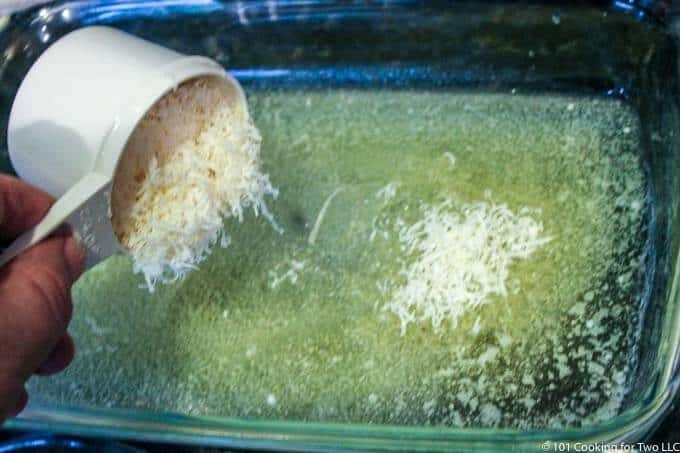 A good quality Parmesan is a must. Cooking time will vary some by the thickness of the potatoes, your pan, and oven. Cook to final internal temperature of about 210 degrees. Glass or ceramic baking dish recommended. 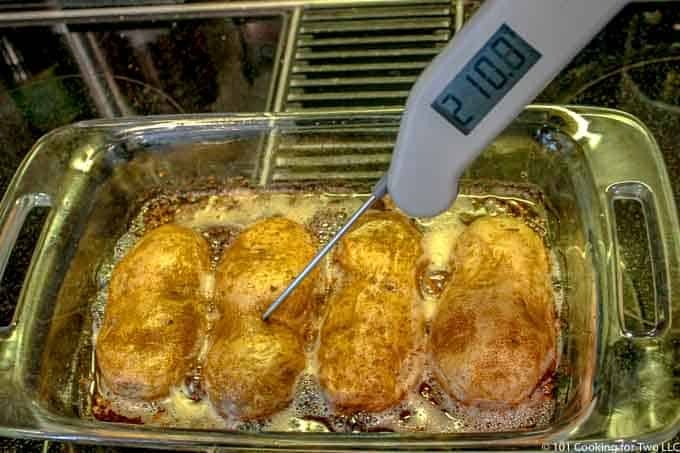 May be cooked at different oven temperatures but the time will need to be adjusted. Be sure to wait the 5 minutes after removing for the oven for the crust to firm up or it will just come off. Do not short the time. And be sure to cut through all the coating just before removing from pan. To adjust the size of this recipe, a little math is needed. You want the "topping" to be about the same thickness. See discussion in the post. This reheats very well in a microwave. This is sooo good!! Thank you for the recipe. My spouse loved it, and I’ll be making it again, for sure. Delicious! What I love about this recipe is that I get something special for almost no work. My lazy is coming out. This was very good and easy too. The cooking time might be just a tad too long since the Parmesan got very brown. I will make these again. The Parmesan does get brown and crisp. Very much my taste and the time is consistent with other recipes. My only pause about shortening the time is be sure the potatoes are done to your taste. I like 210 but some recommend 205. I do fine 200 “acceptable”. Also, a thinner potato instead of a plump one would cook faster so the cheese would not get as brown. Made these as a side for grilled ribeye last night. Best meal we’ve had in awhile. For some reason this reminds me of something my grandpa used to cook. He had an old folding pan — similar to an omelet pan, but more square and deep — that he used to make cornbread or coffee cake using a muffin mix on the stove. Another thing he used to make was potatoes roasted with bacon. Basically, he’d lay down a few strips of bacon, slice a potato in half and put it cut-side down on the bacon, close the pan, then put it on his wood burning stove to cook while he went about his morning routine –shaving, showering, dressing, getting the coffee on. The potato cooked through in perfect synch with the bacon crisping up. They were to die for. First sorry for the delayed reply. If I tell my wife about the bacon, I will need to do it. We so love bacon. I’m thinking bacon hashbrowns as I’m typing. I fixed this recipe and your filet recipe on new years day and both were a 5+. I am cooking for 2 and just used one potato and half a potato each was sufficient. There was a great crust on the potato and I was glad you mentioned cutting between the potatoes so it didn’t pull off. This worked out well as it could cook at the same time as the filet and at the same oven temp. I started the potato, then the steak, and then when the steak went in the oven a little king crab to steam for extra credit. This was a hit with my wife who had no idea what I was fixing. Thanks for a great recipe and site. What if I don’t have granulated garlic? Use regular garlic powder and be sure it is mixed in well. Or skip. DrDan, do you always use salted butter in your recipes? Unless stated otherwise. Most of the time, it is what I have. If you have unsalted (which is fine) I might up the salt a pinch. In this recipe, a lot of the butter does not end up being consumed and the seasoning has lots of salt so it doesn’t matter here. In baking, I try to use unsalted mostly.